Anemia is defined as having an abnormally decreased amount of red blood cells or haemoglobin in the blood stream, which may or may not cause symptoms. Red blood cells are essential to the human body because they contain proteins called haemoglobin, and the function of these proteins is to carry oxygen to the tissues and organs. Red blood cell and haemoglobin levels in the body change from birth to puberty, and it is therefore important to know that these values change throughout these years of life. In babies, the red blood cell and haemoglobin values starts off high and slowly decreases until the stage of puberty where the levels reach the ones we have in adulthood. The reason why it’s important to know that these values are different is so that a young child, with a seemingly decreased red blood cell and/or haemoglobin level, isn’t diagnosed as having anemia. There are three main processes that can lead to people developing anemia. These include acute or chronic blood loss, the decreased production of red blood cells and hemoglobin, and the destruction of red blood cells (hemolysis). Bloodloss may occur due to various reasons that include trauma resulting in internal bleeding or bleeding from injuries, heavy menstrual bleeding, and gastro-intestinal bleeding. Gastrointestinal bleeds can be due to secondary conditions such as peptic,gastric or esophageal ulcers, colon cancer or inflammatory bowel disease. A deficiency in iron or vitamin B12 and/or folate can result in iron deficiency anemia or megaloblastic anemia, respectively. These elements are either depleted from the body or not adequately absorbed by the gastrointestinal tract from the affected person’s diet. Leukemia produces abnormal white cells in the bone marrow, which hampers the ability of this tissue to produce red blood cells, as well as normal white cells andplatelets. Bone marrow failure can be caused by conditions that directly affect this tissue and, like leukemia does, decrease its ability to produce red blood cells. Chronic kidney disease can result in the decreased production of erythropoietin, which is responsible for stimulating the production of red blood cells. Chronic conditions like autoimmune disorders such as lupus and rheumatoid arthritis, and infections such as HIV can lead to decreased haemoglobin levels in the body. This is due to the fact that these conditions make it difficult for the body to absorb iron and to use stored iron to make haemoglobin. Medications such as chemotherapy drugs damage stem cells in the bone marrow which are needed to produce red blood cells. Thalassemia, sickle cell disease and hereditary spherocytosis are red blood cell disorders where the shapes of these cells are not normal. Autoimmune haemolytic anemia is a condition where the body produces proteins, called antibodies, which cause the red blood cells to rupture and expel its contents. Patients with mild forms of anemia may not experience any signs and symptoms of the condition. As the anemia gets worse, patients may experience signs and symptoms such as a pale skin and mucous membranes of the eyes and mouth, fatigue, dizziness, weakness and shortness of breath. 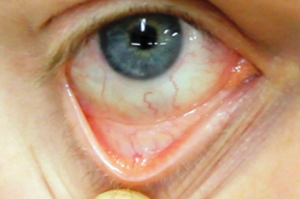 In haemolytic anemia, patients may experience jaundice (yellow discoloration of the skin and/or eyes) and they can produce dark colored urine due to the release of bile from the ruptured red blood cells. In severe cases of anemia, patients can experience a rapid and/or irregular heart rate and loss of consciousness. The diagnosis of anemia is made by looking at the red blood cell and haemoglobin levels on a complete blood count (CBC) blood test. The haemoglobin level is more commonly looked at to make the diagnosis of anemia. The normal adult levels of red blood cells are around 4.5 to 6 million cells per microliter of blood in men and 4 to 5 million cells per microliter in women, and the normal range for haemoglobin is between 14 to 17 grams per decilitre and 12 to 15g/dL in men and women, respectively. If these levels are below the mentioned ranges, then one would be considered to have anemia. Once the diagnosis is confirmed, doctors will proceed to order further tests and investigations to determine the cause of the anemia. Additional information can be obtained from a CBC about the shape and color of the red blood cells, which will help point out some common causes. Red blood cells that are small and pale are usually caused by an iron deficiency, whereas large red blood cells may be due to a folate or vitamin B12 deficiency. Normal shaped red blood cells in the presence of a low haemoglobin level could be caused by chronic inflammatory condition and infections. A peripheral blood smear will also be performed where the blood is physically looked at to determine if there are any other abnormalities present. The shape, size and number of these red blood cells will also help determine the cause of the anemia. If a cause is still not discovered, then a bone marrow biopsy may have to be done to see if there are any abnormalities in this region. The management of anemia will depend on the cause of the condition. Therefore, just as there are many causes of the condition, there will be many ways in which it can treated as well. Anemias caused by the mentioned deficiencies can be managed by supplementing these minerals and vitamins, or by treating any underlying intestinal condition affecting their absorption. Severe iron deficiency anemias may be managed by intravenous blood transfusions, as can anemia due to acute or chronic blood loss. The administration of erythropoietin is performed in patients with chronic kidney disease. Anemia caused by cancers such as leukemia will have to be managed with chemotherapy medications. Bone marrow transplantation will have to be considered if the bone marrow is affected. Surgical removal of the spleen is performed in patients diagnosed with some haemolytic anemias, and steroids are administered to patients with autoimmune haemolytic anemia. In the case of chronic infections causing the anemia, these underlying causes will need to be controlled in order to help address the anemia.